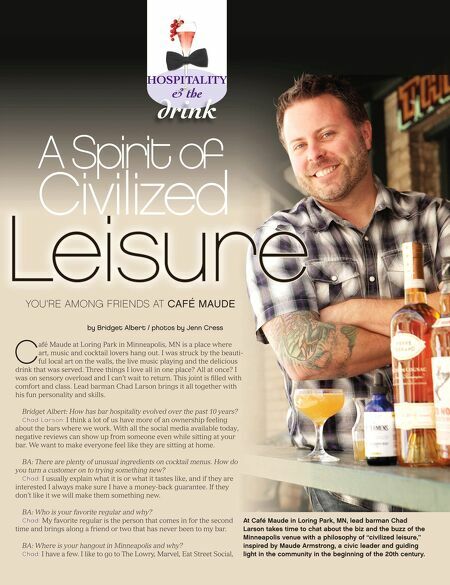 Leisure A Spirit of Civilized C Civilized YOU'RE AMONG FRIENDS AT CAFÉ MAUDE by Bridget Albert / photos by Jenn Cress afé Maude at Loring Park in Minneapolis, MN is a place where art, music and cocktail lovers hang out. I was struck by the beauti- ful local art on the walls, the live music playing and the delicious drink that was served. Three things I love all in one place? All at once? I was on sensory overload and I can't wait to return. This joint is fi lled with comfort and class. Lead barman Chad Larson brings it all together with his fun personality and skills. Bridget Albert: How has bar hospitality evolved over the past 10 years? Chad Larson: I think a lot of us have more of an ownership feeling about the bars where we work. 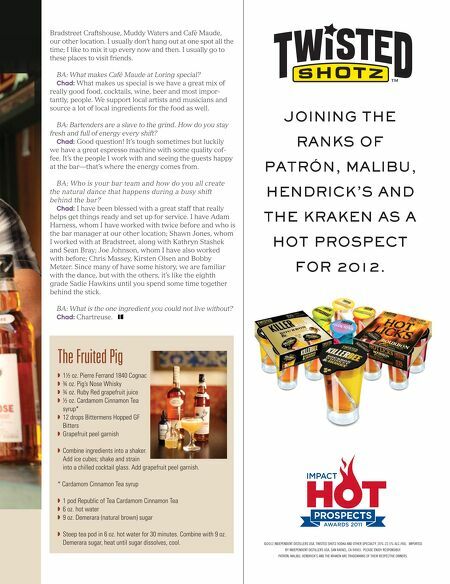 With all the social media available today, negative reviews can show up from someone even while sitting at your bar. We want to make everyone feel like they are sitting at home. BA: There are plenty of unusual ingredients on cocktail menus. How do you turn a customer on to trying something new? Chad: I usually explain what it is or what it tastes like, and if they are interested I always make sure I have a money-back guarantee. If they don't like it we will make them something new. BA: Who is your favorite regular and why? Chad: My favorite regular is the person that comes in for the second time and brings along a friend or two that has never been to my bar. BA: Where is your hangout in Minneapolis and why? Chad: I have a few. I like to go to The Lowry, Marvel, Eat Street Social, 114 / the tasting panel / november 2012 At Café Maude in Loring Park, MN, lead barman Chad Larson takes time to chat about the biz and the buzz of the Minneapolis venue with a philosophy of "civilized leisure," inspired by Maude Armstrong, a civic leader and guiding light in the community in the beginning of the 20th century.